Almost a month to the day after Women's Wear Daily posed the question, yesterday's New York Times ran a lengthy piece inquiring about the absence of black models on the recent fashion runways. Over the course of some six weeks and four cosmopolitan cities — New York, London, Milan, Paris — the number of dark faces on the runways was abominably low. (L.A. Fashion Week starts today.) But was the absence of black faces really that startling? Not really. Times writer Guy Trebay and his coterie of quotable, high-powered image experts (IMG's Ivan Bart, veteran agent Bethann Hardison, Diane von Furstenberg) can pin the lack of diversity among models on fashion designers and model bookers all they want, but perhaps — as designer Vivienne Westwood angrily points out in today's Telegraph — they should be taking a good hard look at "racist" (her word, not ours) magazine editors. Marie Claire: 10, 1 of whom is a celebrity: Walgreens (3), Olay (1), Johnson's Soft Lotion (1), Diesel (1), CoverGirl (1), Puma (2), JCPenney (1). W: 3, 1 of whom is a celebrity: Target (1), L'Oreal (1), Turks & Caicos tourism board (1). Vogue: 6, 4 of whom are celebrities: Revlon (1), American Express (1), Diesel (1), JCPenney (1), Vaseline (1), Avon (1). Harper's Bazaar: 2, 1 of whom is a celebrity: Make-A-Wish Foundation (1), CoverGirl (1). Glamour: 3, none of whom are celebrities : Aquafresh White Trays (1), Liz Clairborne (1), Lee Jeans (1). Elle: 13, 3 of whom are celebrities: Target (1), MAC Cosmetics (1), Diesel (1), Puma (2), Benetton (1), Avon Foundation (1), House of Dereon (4), Secret (1), Botox* (1). &apos;Vogue&apos; Editor Anna Wintour Has A "BBF"
*Wait, didn't Naomi Campbell say that black don't crack? Why does it matter whether black models are on the covers or within the fashion editorial spreads of women's magazines if they're already shown shilling drugstore-brand cosmetics and fashions found in mid-range department stores? Because the covers and the fashion editorials of women's magazines are where aspiration resides, where the seeds of fantasy are planted (read: manufactured). There may not be a lot of money for your average model in a 4-page Glamour feature on fall outerwear — she's hoping more for that lucrative cosmetics contract with L'Oreal — but there's a lot of power: It is on the editorial pages that an editor communicates most directly with her readers. There's a reason why impressionable, fashion-obsessed 13-year-old girls choose Steven Meisel-lensed fashion spreads over CoverGirl lipstick ads when decorating their bedroom walls. And the covers, when they do feature a black face, are almost always given up to a celebrity, a woman who most likely has straightened, lightened, contoured and streamlined her hair and facial features to as close an approximation of whiteness as possible. You know what would be really political? If women's magazine editors debated the diversity of black beauty not just in the conference rooms of white-shoe law firms but in their pages. 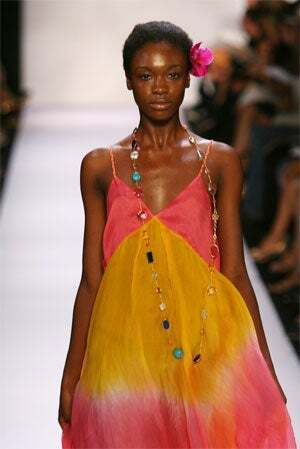 Earlier: Black Fashion Industry Insiders Ask: Where Are The Black Models?